Newsflash: Tomorrow is the last day of 2009. That means we’re moving into the first new decade of the 2000s. And we have a decision to make. Say “2009” outloud. 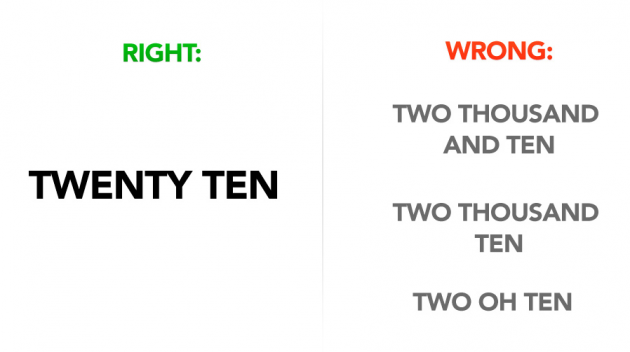 Chances are you’re saying “two thousand and nine.” But if you think about it, that’s weird. Say “1909” outloud. Chances are you’re saying “nineteen-oh-nine.” It makes some sense, since we weren’t going to pronounce “2000” as “twenty hundred,” but for whatever reason, going forward, we never moved to something like “twenty-oh-one” for “2001” and so forth. A new website is urging us to do just that for the next decade. Say the year “1810” out loud. Now say the year “1999” out loud. See a pattern? It’s been easier, faster, and shorter to say years this way for every decade (except for the one that just ended) instead of saying the number the long way. However, many people are carrying the way they said years from last decade over to this decade as a bad habit. If we don’t fix this now, we’ll be stuck saying years the long way for the next 99 years. Don’t let that happen! The site also has a Facebook Group and Fan Page, just to drive the point home. The fan page actually has over 17,000 fans. So choose now, but in the words of the Grail Knight from Indiana Jones and the Last Crusade, “choose wisely” or we could be stuck wasting words for the next 89 years (their math is a little off, but don’t let that distract you).